Removals, Man and Van, Storage, Office Moves and House Clearance in the Harrow postal district. The Allen & Young Moving Company are pleased to be able to offer the full range of our Removals, Packing, Man and Van Hire, Storage, House Clearance and a range of Business Moving Services to all Harrow Districts and all of the following postcodes: HA0, HA1, HA2, HA3, HA4, HA5, HA6, HA7, HA8 and HA9. About the Harrow postal district. 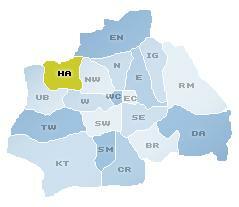 The HA postcode area, a.k.a. the Harrow postcode area, is a group of 10 postal districts in north west Greater London, England, which are subdivisions of 7 post towns: Wembley, Harrow, Ruislip, Pinner, Northwood, Stanmore and Edgware. These towns are situated across post codes: HA0, HA1, HA2, HA3, HA4, HA5, HA6, HA7, HA8 and HA9. Allen and Young Ltd carry out all moving services including removals, man and van, storage, packing and house clearance in the Harrow area. The main sorting office is on Green Park Way in Greenford and the area served covers parts of the London Borough of Harrow, the London Borough of Hillingdon, the London Borough of Brent and also the London Borough of Barnet.